High resolution and performance at a remarkably affordable price! Our new 5 megapixel Digital Microscope Camera boasts high resolution live color images and an efficient internal processor paired with user friendly software compatible with Windows XP, Vista, 7, 8 and 10 (not Mac compatible). Science meets technology in a dynamic way with this all new compact camera! Crystal clear images and videos can be efficiently saved to your computer via USB cable (included). Take them, save them, even email them. 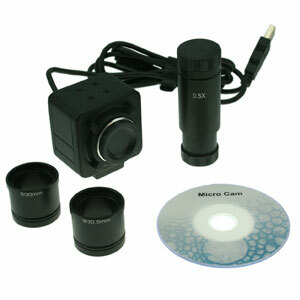 Our digital microscope eyepiece camera is a low cost way to upgrade any microscope to digital on the go. Analyzing, presenting, and sharing images of samples and specimens is easier than ever! Can be fitted on any standard 23mm microscope eyetube (replacing the existing eyepiece) and includes adapter sleeves for both 30mm and 30.5mm for compatibility with most stereo microscopes. Featuring built-in C-Mount compatibility and 23mm reduction lens adapter, our camera can be attached to any instrument with a C-Mount or a 23mm photo port, including microscopes, telescopes, endoscopes and others.